Are you searching for the best air purifier with a washable filter or the best air purifier with a permanent filter? There are many products on the market and while they all claim to be the best, they’re not made equal. It’s a wise decision to invest in air purifiers with permanent washable filters. They’re reusable and can be very affordable in the long-run. You will not have to replace the filter every few months. Let’s have a look at four of the best air purifiers with permanent washable filters. If you want a purifier that is powerful and also looks good then consider opting for Honeywell HFD-120-Q QuietClean Tower Air Purifier with Permanent Washable Filters. This tower-shaped filter comes with washable and permanent filters. It’s quite cost-effective in the long-run and is also easy to use as it lets you know when it’s time to wash the filters. Other than this, the unit is also said to save energy as it is Energy Star certified and uses little electricity. The filter is able to circulate and filter air 5x per hour. You will not have to worry about airborne particles and allergens with this unit working for you. The two filters work together to kill 99% airborne allergens – even particles as small as 0.3 microns. In fact, it’s said to be able to capture 18 times more pollutants than other similar options. It offers three cleaning levels and comes with a 5-year limited warranty. Who Is It For? 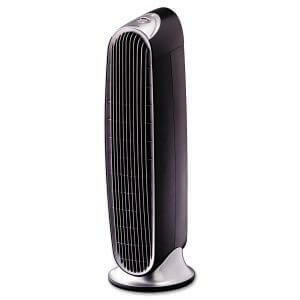 Honeywell HFD-120-Q QuietClean Tower Air Purifier can be a good option for mid-sized rooms. Choose it if you want your family to enjoy clean air. If you want a filter that removes not just smoke and allergens but also chemical gases, odor, germs, mold, viruses, and bacteria then bring home the Envion Therapure TPP240 Permanent HEPA Type Air Purifier. This beauty is quite affordable as it comes with cleanable filters that remove the need to find a replacement every few months. It has a 240hour automatic timer that makes it quite efficient. Plus, it’s known to kill harmful VOC’s as well. It comes with a one-year warranty and offers several running modes including night mode that makes the purifier emit low light. Who Is It For? Envion Therapure TPP240 Permanent HEPA Type Air Purifier is said to be suitable for users who have a big house. Winix 5502-2 can be a good option if you want a filter that covers a wide area and has a strong CADR rating. In fact, it has the best CDR rating among all our picks. Hence, it’s the safest option when it comes to air purifiers. This beauty offers 3-stage filtration including a True HEPA filter, a carbon filter, and the latest PlasmaWave technology. This all-rounder covers an area of 360 sq. ft. and captures 99.97% pollutants found in the air. It creates no harmful ozone and safely removes various kinds of impurities including allergens and chemical vapors. Comes with a simple yet detailed user manual. The indicator makes it easy to know air quality. Works exceptionally well and may even help get rid of skin conditions due to impurities. Might be a little too heavy for some users. The replacement filters are very costly. The Turbo setting may be too loud for some users. Who Is It For: It’s for people who want a purifier for small to mid-sized rooms. It works well and can remove not just dust and chemicals but odor as well. Related Post: How Do You Know if You Have Dust Mites? Honeywell AirGenius 5 Air Cleaner/Odor Reducer claims to capture 99.9% of particles in the air. For many, it’s the best air purifier with washable filter thanks the famous ifD filter it uses. The purifier is designed for mid-sized rooms (250 sq. ft.) and comes with five clean settings. It’s technologically advanced and looks very sleek as well. The unit has smart touchscreen controls that give it a unique look. It creates no noise and offers 2-12 hour automatic shut off function for added ease. The unit is ARB Certified and complies with ozone emission limits. It’s also affordable as it helps save energy and comes with a 5-year warranty. Plus, you may also opt to add filters as you desire. Makes a lot of noise at max. Who is it For? Honeywell AirGenius 5 Air Cleaner/Odor Reducer is for anyone who wants a clean environment with no odor. If you have pets then this beauty can be a very good choice as it reduces allergens. When it comes to performance, the difference of .02% is not much of an issue. They work at the same level, hence you may opt for any of the two. The second option is a “permanent filter”. These filters require no cleaning. In fact, exposure to water may ruin the filter. They are cleaned with a vacuum cleaner. Other than this, some units let you add additional filters as well. This factor can be important when selecting an air purifier. Related Post: Do Air Purifiers Really Work? Area: This is of huge importance because the right purifier depends largely on the area. Calculate the size of the room and pick a purifier that can circulate and filter air about 5x per hour. A weak purifier will not be able to clean a big room. Our personal favorite is Envion Therapure TPP240 Permanent HEPA Type Air Purifier as it’s suitable for 500 sq. ft. rooms. You may also opt to use two purifiers in a single room but that may add to the cost. CADR Rating: Shortened for Clean Air Delivery Rate, the ratings indicate how reliable a purifier is. The higher the rating, the better it is at cleaning specific contaminants. For example, look at “smoke” CADR rating to know how well a purifier can remove tobacco smoke. You may use this rating to compare different options. Our personal favorite is Winix 5500-2 Air Purifier with True HEPA, PlasmaWave and Odor Reducing Washable AOC Carbon Filter as it’s rated quite high. Size and Weight: This is of huge importance if you want a mobile purifier. While most units weight about 15 pounds, you may even be able to find purifiers under 5 pounds. Our go-to option would be Honeywell HFD-120-Q QuietClean Tower Air Purifier with Permanent Washable Filters as it’s quite easy to move around. Environment: Consider the kind of pollutants and contaminants found in your surroundings when selecting a purifier. One purifier may not be able to fully eradicate all kinds of contaminants. For example, Honeywell AirGenius 5 Air Cleaner/Odor Reducer 250 sq. ft can be a good choice if you have pets as this purifier can reduce the risk of allergens and also make the room smell fresh. Other than this, make sure to pick a unit that’s under your budget, comes with a decent warranty, offers good customer service, and easy to use.